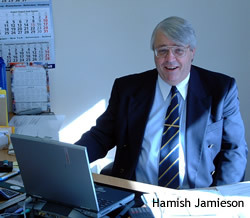 We have teamed up with Hamish Jamieson at FreighterTravel (NZ), based in Napier, New Zealand, who have a register of almost every passenger carrying cargo ship in the world and provide a worldwide booking service for freighter ship cruises. Hamish also has occasional special offers available on certain voyages, if you are interested in receiving them. When he replies to your booking request, he will let you know how you can sign up for these if you wish. Please send Hamish your details using the booking form below - he will be happy to help you! Please note that freighter cruises are NOT a cheap alternative to flying - a voyage by freighter will be a lot more expensive than an air ticket - they are just a different type of cruise vacation and priced at about the same level. You tell me that you want to book. I get an offer from the relevant shipping company and make it to you. Usually the shipping company will allow you an "option" of one week - during this time they will not offer the cabin to anyone else. If you want to accept the offer you must complete a Passenger Questionnaire and a Passenger Declaration and pay a deposit of 25% of the fare. Usually 45 days before the ship sails, you will be asked to provide a copy of the photo page of your passport, copy of the required visas (if any are needed we will advise you), proof that you have travel insurance (it's absolutely vital that you are insured) and the final balance of the fare. We will always try to advise you of the visa, passport and vaccination requirements for any particular voyage - BUT you are expected to do your own research and make your own decisions. WE cannot be responsible for visas as each country has differing requirements for different nationalities. It's our job to make things easy - you are always welcome to ask any questions whatsoever - we are here to help and make your voyage pleasant & hassle free. Completing this form is simply a request for more detailed information concerning the voyage you are interested in - you are not obligated to make a booking at this stage. To send your booking request, please click the button below ONLY ONCE to avoid sending multiple messages. A confirmation screen will be displayed to verify that your message has been posted, but it may sometimes take up to 20-30 seconds to appear. Thank you. It is not necessary to book with an agent located within your own country. The entire booking process can take place via telephone, email or fax etc - there will be no need to visit the booking office personally. FreighterTrips.com applies no surcharge to the prices quoted by agents - booking via this form will cost exactly the same as contacting the agent direct. The email address and other contact details submitted with this form will only be used by the agent to respond to your booking request. You will not be added to any mailing lists.